A RITE OF SWORDS is Book #7 in the Sorcerer's Ring, which begins with A QUEST OF HEROES (Book #1), a free download! In A RITE OF SWORDS (Book #7 in the Sorcerer's Ring), Thor grapples with his legacy, battling to come to terms with who his father is, whether to reveal his secret, and what action he must take. Back home in the Ring, with Mycoples by his side and the Destiny Sword in hand, Thor is determined to wreak vengeance on Andronicus’ army and liberate his homeland—and to finally propose to Gwendolyn. But he comes to learn that there are forces even greater than he that might just stand in his way. Gwendolyn returns and strives to become the ruler she is destined to be, using her wisdom to unite the disparate forces and drive out Andronicus for good. Reunited with Thor and her brothers, she is grateful for a lull in the violence, and for the chance to celebrate their freedom. But things change quickly—too quickly—and before she knows it, her life is thrown upside down again. Her elder sister, Luanda, caught in a fierce rivalry with her, is determined to wrest power, while King MacGil’s brother arrives with his own army to gain control of the throne. With spies and assassins on all sides, Gwendolyn, embattled, learns that being queen is not as safe as she thought. Reece’s love with Selese finally has a chance to flourish, yet at the same time, his old love appears, and he finds himself torn. But idle times are soon overcome by battle, and Reece, Elden, O’Connor, Conven, Kendrick, Erec and even Godfrey must face and overcome adversity together if they are to survive. Their battles take them to all corners of the Ring, as it becomes a race against time to oust Andronicus and save themselves from complete destruction. As powerful, unexpected forces battle for control of the Ring, Gwen realizes she must do whatever it takes to find Argon and bring him back. In a final, shocking twist, Thor learns that while his powers are supreme, he also has a hidden weakness—one that may just bring his final downfall. Will Thor and the others liberate the Ring and defeat Andronicus? Will Gwendolyn become the queen they all need her to be? 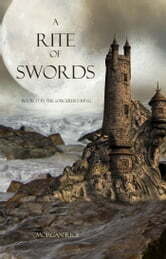 What will become of the Destiny Sword, of Erec, Kendrick, Reece and Godfrey? And what is the secret that Alistair is hiding? With its sophisticated world-building and characterization, A CHARGE OF VALOR is an epic tale of friends and lovers, of rivals and suitors, of knights and dragons, of intrigues and political machinations, of coming of age, of broken hearts, of deception, ambition and betrayal. It is a tale of honor and courage, of fate and destiny, of sorcery. It is a fantasy that brings us into a world we will never forget, and which will appeal to all ages and genders. All 17 books in the series are now also available! Other than the many spelling mistakes which I found rather irritating, I enjoyed the adventure n the combat and the many vivid descriptions of the war fronts. I loved the depth of each character that played a role in this book. Well done. Keep us guessing till the last word on how the characters evolve and survive. Cannot wait to read the next book! Really enjoyed reading all of the series of books kept my interest from beginning to end.